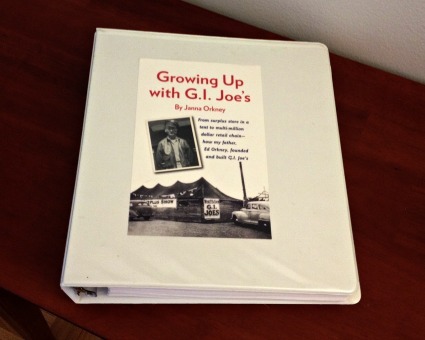 I completed the manuscript of Growing Up With G.I. Joe’s in December, and just today, I received the final piece of data needed for the copyright page at the front of the book. That means it is now time for me to get quotes for printing the book! Hard to believe that I am almost at the end of the production process of the publishing,and moving into the promotional part of it. Before printing the final book, I am asking for some pre-publication copies to use for one more copy edit to correct mistakes, and also to send out to folks to review and send me comments that can be used in the front of the book. Then the final printing will happen. The official publication date is tentatively May 2015, when, hopefully, Growing Up… will be in stores! Photo is of binder holding final manuscript, but without the current cover design. So proud of you, Janna. Can’t wait to read it!